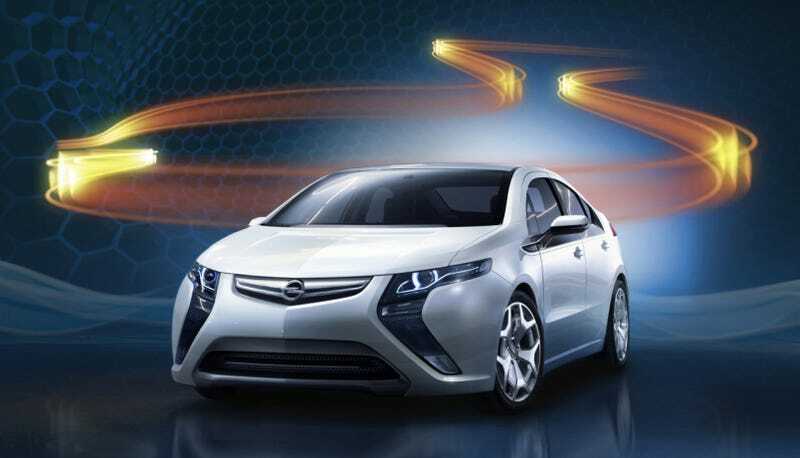 GM has officially unveiled the Opel Ampera, Europe's version of the Chevy Volt. In a reversal of usual practice, the Ampera is mechanically identical to its American cousin but is much better looking. This is the second version of the Volt we've seen in a week, with the 2010 Holden Volt throwing a shrimp on the eco-friendly barbie last Thursday. While we suspect that Holden may have had one tinnie too many, the Ampera gains an attractively angular front fascia to set it apart from its new world relatives. The 2010 Opel Ampera's electric-only range will be identical to the Volt's 40 miles, but let's put it in kilometers for all our cheerfully backwards European friends: 60 Km. The revolutionary Opel Ampera, which will premiere March 5 at the Geneva Motor Show, will be the first emission-free, electrically propelled automobile in Europe suitable for everyday driving. For journeys up to 60 km, the five-door, four-seat hatchback runs on electricity stored in the 16-kWh, lithium-ion battery, and emits zero CO2. When the battery's energy is depleted, electricity from an on-board engine-generator extends the Ampera's range to more than 500 km.